Yes, daylilies are "those orange flowers" but did you ever imagine how many sizes, shapes, and shades of orange that could be? We have lots of orange daylilies at our farm but this collection has been specially sorted to offer you a fun variety of the sunniest of the sunny! Your collection will include 2 fans of each of the following 7 daylilies (for a total of 14 fans/plants): Fairy Firecracker, Ruffled Buds, Byron, Saratoga Springtime, Second Glance, Celestial Peach, and Penny Serenade. 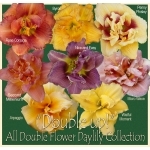 Four out of the seven varieties are also re-blooming daylilies which means they bloom and then will bloom again later in the season! Regular shipping rates apply. Quantities are limited to what's growing in our fields, no rainchecks.